The Full Moon takes place on 5 January 2015 and appears in Cancer. This means that our world of Tarot Court cards, the corresponding Card character is The Queen of Cups. This character is caring, empathetic and often with a psychic streak a mile wide. A healthy Queen of Cups understands the power of emotional hooks can help YOU understand – and even dispel – those that are hooked into you! She cares how people FEEL and revels in cultivating great relationships and making genuine connections with people. Tom Cruise is a Cancerian and he is as well-known for his abilities to remember, for example, a wardrobe department assistant’s name AND all her family details as he is for his toothsome grin and Scientology beliefs. Oh yeah, and his ACTING, of course. 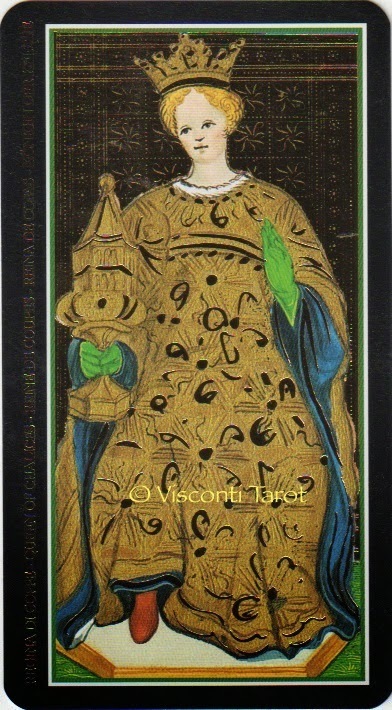 In your deck, does your Queen of Cups have the lid on or off her chalice? If she has the lid on – does this mean that she contains her emotions and avails herself of them when she WANTS to? If the lid is off, does it indicate that her emotions swill around and over the sides whenever idle fancy takes her? What’s your opinion on the lid on/off interpretation? So far so wonderful, but an UNHEALTHY Queen of Cups will be an arch manipulator of your emotions – a moody emotional vampire who leaves you an exhausted wrung-out rag! In arguments, an unhealthy Queen of Cups will trump whatever statements of fact you might have with some over-blown (usually!) statement about her health and thus completely wrong-foot you. *cough* not that I’m speaking from personal experience AT ALL. I'm the opposite of Bonnie, I tend to see the negatives of this lady. The only friend I have ever actually talked to saying "I don't want to be friends anymore" was a total Queen of Cups Rx. Too exhausting! Totally agree – 'exhausting' is a brilliant key word here for an unhealthy Queen of Cups. My mother often exhibits her QoC rx qualities and they make me want to run outside and get lungfuls of air! LOL I tend to see the positive side of this Queen – although I have known individuals that exemplify the negative side to a "T"!